Raising attainment through entertainment and learning through laughter. 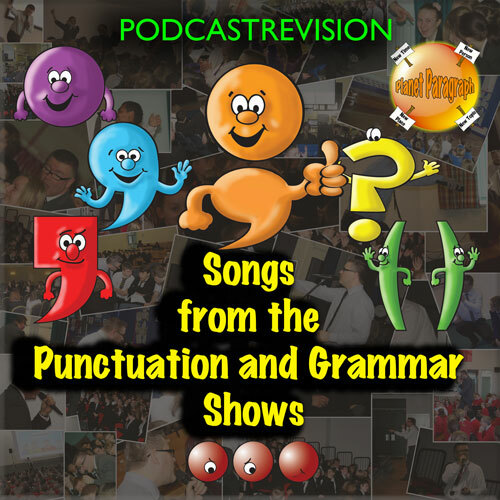 An album of fun and catchy songs designed to help you remember the basic SPAG terms. By purchasing the songs, you are agreeing to use them in one school only, in ways appropriate for learning. You are not authorised to pass the work or ideas off as your own or distribute them via your own website or social media account. You may show videos at revision evenings or parents' evenings. The mission of The Punctuation Show is to raise attainment through entertainment and encourage pupils to learn through laughter. We aim to please in everything we do and will go out of our way to provide outstanding customer service. Check out the latest article on our blog. Connect with us on the platform of your choice to get updates of what The Punctuation Show is doing and for offers, resources and competitions. By signing up to our newsletter, you get free resources in your inbox regularly to save your precious time. What's not to like? I consent to having The Punctuation Show collect my name and email.